IDJ has sent this 1997 article published on behalf of the HK Academy of Engineering Sciences and HK Institution of Engineers. 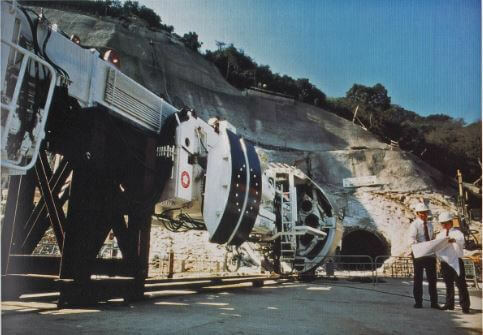 “In 1989 Hong Kong Electric pioneered the introduction of mechanised tunnelling to Hong Kong, accepting the only bid that proposed the use of a tunnel boring machine for the construction of a 5.7 kilometre, 5 metre diameter cable tunnel as part of its transmission network, thus heralding a new era in tunnelling work in the city. HF: SteveHK left the following comment on 26th September 2018, The Tunnel Boring Machine was manufactured by The Robbins Company of Kent, Washington State USA and the Main Contractor was the Hong Kong Branch of Nishimatsu Construction Co., Ltd, who designed and built the tunnel. I have added links to these companies below. This article was first posted on 5th April 2017.